Even though less than two months remain for the June 24 snap elections, opposition parties in Turkey still have to designate and present their candidates against President Recep Tayyip Erdoğan. Expected to be a candidate, Turkey’s 11th President Abdullah Gül announced that he will not take part in the presidential elections at a press conference he held on Saturday. 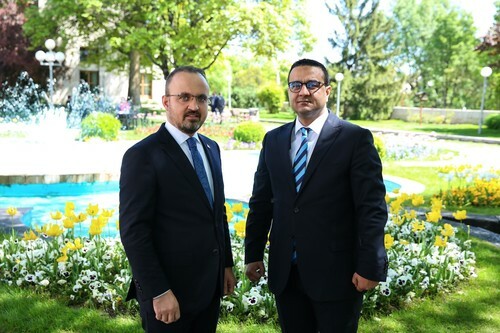 Answering Daily Sabah’s questions, Justice and Development Party (AK Party) Group Deputy Chairman Bülent Turan asserted that the main opposition’s interest in making Gül a candidate is nothing but a pity. Turan said one cannot be a leader by seeking favorable circumstances for candidacy and by negotiating behind closed doors. In addition, Turan believes the opposition parties will fail to converge on a candidate that could challenge the People’s Alliance. Expressing that the incident, in which 15 Republican People’s Party (CHP) deputies were transferred to the Good Party (İP) in order to facilitate Chairwoman Meral Akşener’s presidential candidacy, is a stain on Turkey’s political history, Turan asserted that the CHP is suffering from a leadership crisis and CHP Chairman Kemal Kılıçdaroğlu is a failed leader who cannot keep his party together, rendering it an imitation of the pro-PKK Peoples’ Democratic Party (HDP). Daily Sabah: Until very recently, the AK Party was denying any claim regarding the snap elections and was underlining that the elections were to be held in November 2019. What has changed in the last couple of weeks that made the AK Party decide on snap elections? Bülent Turan: The AK Party has always advocated that the elections should be held according to their predetermined schedule. It is a necessity of the representation bestowed upon you by the people to hold onto this duty until its very last day. This being our principle, we have always said that the elections should take place when they should take place. However, when the discussions on snap elections started and continued to be the focus of the daily agenda in politics, it is not possible to ignore these discussions as it could possibly harm politics as an institution. Political uncertainties will exacerbate in such a situation and it will cause discomfort to the public. To eliminate these political uncertainties and transition into the presidential system as soon as possible, our party commissions have decided for snap elections. DS: When the snap elections were announced the main opposition party CHP alleged this was actually an “ambush election” and that the country cannot hold elections during the ongoing state of emergency. What are your comments on these allegations? BT: First of all, we have to make a distinction between elections and the state of emergency. The ongoing state of emergency is all about countering terrorist efforts; it has nothing to do with election security. Secondly, Turkey has realized numerous elections during a state of emergency. All elections from 1987 to 2002 took place under the state of emergency. It is quite meaningless to oppose elections on this basis as it is not a first in Turkey’s history. Meanwhile, the main opposition should take a look at its own past before making such allegations. When the coalition consisting of the True Path Party (DYP) and the CHP decided on snap elections in 1995, the elections took place 58 days after this decision. When we made this decision, there were 67 days to elections. Similarly, when this coalition went for elections many cities were under the state of emergency. So, how come it is “good” when they do it, but “bad” when the AK Party does the same? The main opposition’s policies are inconsistent; they rejected the motion proposed to the Parliament’s Advisory Board and aimed to swiftly discuss the snap elections. They have also opposed this motion at a General Assembly session. However, they voted for the motion at Parliament’s Constitutional Commission. We cannot be sure which of these were the main opposition’s real preferences. DS: There were many speculations on former president Abdullah Gül’s possible candidacy. On Saturday, during a press conference, Gül expressed that his name was discussed as a candidate independently from him and announced that he will not be a presidential candidate as the opposition parties failed to reach a consensus. What is your take on this subject matter? BT: Eleven years ago Erdoğan himself did not become the candidate for such an important post, but appointed “his brother” Abdullah Gül as the candidate, showing the importance of being loyal to the cause in the AK Party. It is said that the human mind is plagued with forgetfulness, however, we do not forget. At the time, the main opposition party and other organizations around it took the streets to prevent Gül from being a presidential candidate. Those who were exhilarated by the memorandum of the military also baselessly argued that the approval of 367 members of Parliament was needed to become president and they took this to the Constitutional Court. They have threatened the Constitutional Court with civil war in Turkey. Now, if the main opposition is trying to make a joint candidate out of Gül like all of these did not happen, it is a sign of their pitifulness. People and party administrators make mistakes. You may have implemented wrong policies at a time. If you want to renounce these policies and want to turn a new page, first you have to self-criticize and convey these criticisms to the public. However, the main opposition party is still following its usual policies and simultaneously supporting a name that they have opposed fiercely in the past. How could such a political movement become the ruling party? Why should the public support those who do not have a word to say to them? The AK Party is built on fidelity; this is what we learned from our leader. If a leader appoints his “brother” to presidential candidacy instead of himself, his “brother” should do the same. However, this was not the case. Once again, we have seen that leadership is to walk together with the people in a courageous manner without looking back. You cannot be a leader by waiting for favorable circumstances and through negotiations behind closed doors. It is also ironical that this development took place on the anniversary of the military memorandum which aimed to prevent the 2007 presidential elections. DS: Seemingly the opposition parties failed to converge on a candidate as was also the case in the 2014 presidential elections. How do you evaluate the opposition’s quest for a joint candidate? Will these efforts lead to a fruition? BT: I do not believe it will yield any substantial results. The public will not support politics based only on being against Erdoğan. Does the opposition have projects regarding the development of the country? Does the opposition have a road map for Turkey’s economic development? No, they do not have any. The opposition only recites its hatred for President Erdoğan on a daily basis. Seeking a presidential candidate with a magnifying glass will yield no results. This is nothing but political engineering. Those who want to manipulate politics with such external tools will be rejected by the public. As a matter of fact, such initiatives of political engineering in the past have never yielded results. Whenever elections took place, the public taught the greatest lesson to those attempting political engineering. Where are the political parties which were bestowed with power by the military following the Feb. 28 coup? What are their leaders doing today? Are they even remembered by the public? The society always thwarts social engineering. For this reason, the opposition’s quest for a joint candidate will be fruitless. DS: The main opposition party CHP is yet to propose a presidential candidate. In your opinion, why is the CHP having such a hard time in finding a candidate? BT: The CHP is mired in a leadership crisis. We see a chairman who fails to keep his party together and renders the CHP as a bad replica of the HDP. We are talking about a chairman who appointed an HDP supporter as the CHP Istanbul provincial chairperson and who sends his deputies to visit Selahattin Demirtaş. They fail to create a political discourse that is inclusive as they are inconsistent. They say that they support the Afrin operation, yet oppose our military’s entrance to the Afrin city center. They said they would vote for the removal of immunities, yet, we still do not know whether they voted for it or against it. They said they want snap elections; when snap elections became the reality, they started to change their minds. Because of all these inconsistencies, the public is unable to trust the CHP. In turn, for this reason, the CHP is unable to propose a candidate among its deputies. DS: The president is no longer ceremonial in the presidential system. Why doesn’t the CHP appoint their own chairman as the presidential candidate? BT: As you have said, the president will no longer have ceremonial duties, but political ones. The president will have both responsibility and authority as the head of the executive. The government will be formed by the president. Therefore, the president should have a vision regarding the country. He or she also has to be apt in administering a country. Yet, the main opposition party is still acting as if the country is to be administered with the parliamentary system, as if the April 16, 2017 referendum did not transform the system of governance. You cannot make policy by divorcing from reality. In such a system, the main opposition party’s chairperson should be a presidential candidate. If the public is so keen on getting rid of the AK Party and Erdoğan, Kılıçdaroğlu should be the candidate. However, as he is aware that he will fail to harness the support of the public, he is shying away from being a candidate. He is trying to keep his post as the chairperson of the CHP by hiding behind another candidate. Unfortunately, neither the CHP electorate nor Turkey deserves such a figure. DS: Last week 15 CHP deputies resigned from their party and joined the İP to facilitate İP Chairwoman Meral Akşener’s presidential bid. What is your take on this incident? BT: It is definitely one of the most embarrassing incidents in our political history. How could a political party leader “rent” their deputies to another party? The public has voted for your party particularly for these deputies. Before the elections, the CHP claimed that they care about the will of the party members and for this reason they held a preselection. Now these deputies are transferred to another political party without the consent of their electorate. The shame of the Güneş Motel incident haunted late Bülent Ecevit until his death; now the shame of this new Güneş Motel incident will continue to haunt Kılıçdaroğlu. He will be remembered with this shameful incident all his life. Nothing could be more shameful for a party chairman. On the other hand, the Supreme Electoral Council [YSK] had already decided that the İP is eligible for the presidential elections. Considering these circumstances, I believe transferring deputies to the İP as if the party is somehow “victimized” is definitely a product of a very interesting mindset. DS: Everyone is focused on the presidential elections, however, the parliamentary elections will also take place on June 24. Will the AK Party change its parliamentary candidate list substantially? BT: In all elections we have entered, we always altered our candidate lists. If you want to be permanent as a political party, this is what you should do. As long as there is change, your party continues to grow and you expand to different fields. This was also expressed by President Erdoğan. Our lists will change. As we have said this many times before, governmental and party positions are temporary for us. Regardless of our posts and positions, we will continue to fight for our party and our cause. The opinions of our members are equally important to us. Many of our friends who were deputies in previous terms are now serving the AK Party at different posts. Therefore, discussions about becoming a candidate or not do not take place in our party. DS: As the elections are to take place on June 24, there are questions whether the required parliamentary bylaws and adjustment laws will be implemented before the elections. What is the road map of the AK Party regarding the adjustment laws? BT: Some of the adjustment laws were already ratified by Parliament before the announcement of the snap elections. On the other hand, some of the laws could be implemented after the elections. Last week, a package consisting of 10 articles that aims to adjust the electoral laws to the presidential system was ratified by Parliament. The remaining laws will be either implemented with executive orders or through parliamentary ratification after the elections. DS: In the case Erdoğan is re-elected as a result of the snap elections, how will his re-election affect domestic politics in the following years? BT: Turkey will continue its economic development and democratization. Large-scale projects will also continue. Meanwhile, we will continue to work toward our 2023, 2053 and 2071 goals. Therefore, the existing dynamic structure will still be relevant. Actually, long lasting governments like the AK Party government empowers the opposition parties and forces them to create policies. However, the exact opposite happens during the AK Party government. It is still the AK Party who creates policies. The main opposition believes that the usage of old methods will yield new results. Each and every time they are disappointed. I believe the main opposition will continue to be disappointed at every turn.